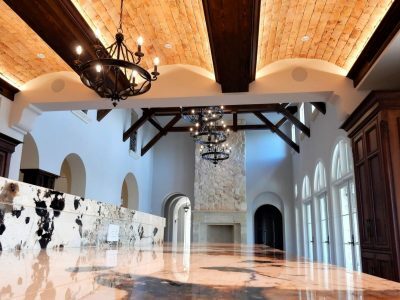 A grand European Country estate home with exquisite handmade & rusticated finishes throughout. 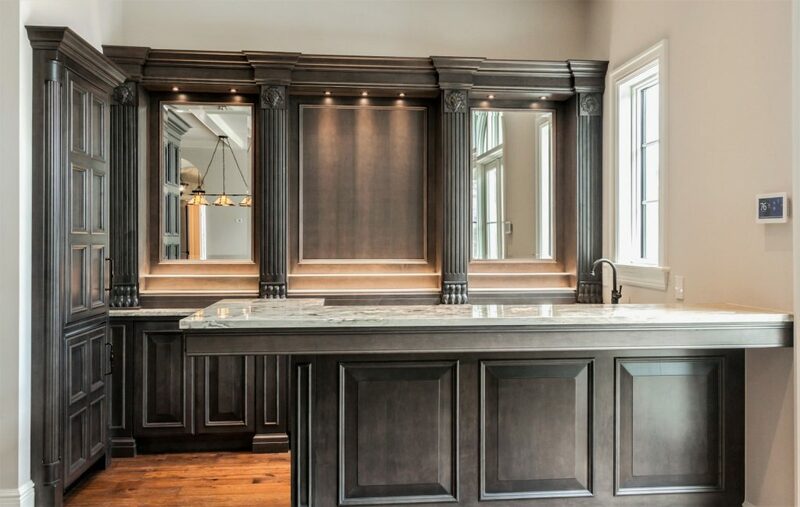 We designed & executed the bespoke cabinetry & custom furniture in fine hardwoods (including African mahogany, rustic cherry, knotty alder and distressed paints in a range of colors). 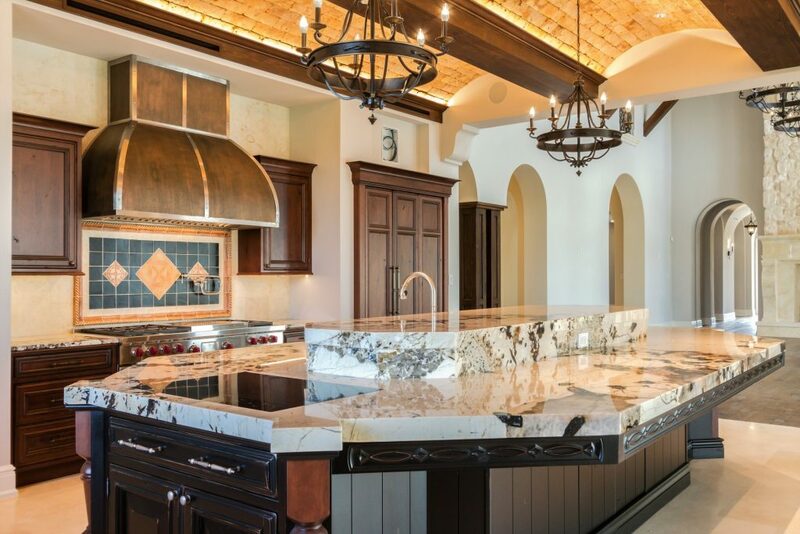 The Kitchen concept & furnishings needed to resonate with the adjacent grand spaces of this manor – and truly enhance the comfort and day-to-day livability of the family home. 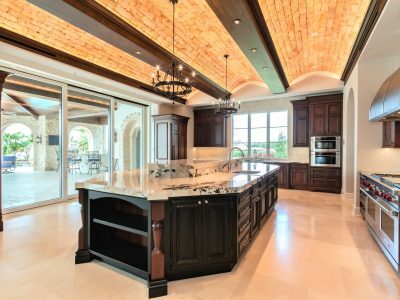 Highlights include Sub-Zero refrigeration (hidden inside tall armoires), Wolf cooking appliances, and bespoke cabinetry in Rustic Cherry and Dusty Black paint. 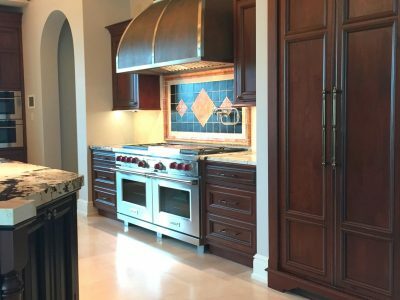 Although the room must perform well for multiple cooks on occasion (with two dedicated prep/cooking areas and separate clean-up/china storage zone), the homeowner was adamant that the kitchen not become a cold commercial space. 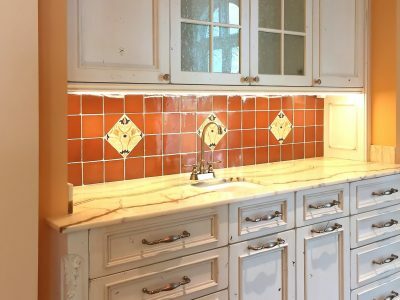 To preserve the mystique of time and “life well lived,” the appliances simply needed to disappear (as much as possible) into the woodwork & walls. Rustic Cherry cabinets in a silky wax finish. 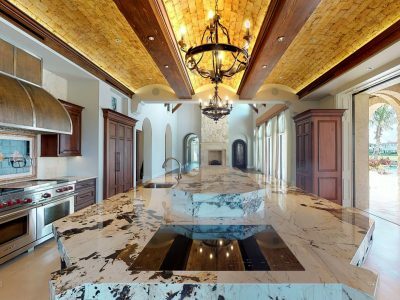 The large island is always “party central” with generous seating for five (with massive cantilevered stone counter supported by carved wood apron & hidden steel frame). 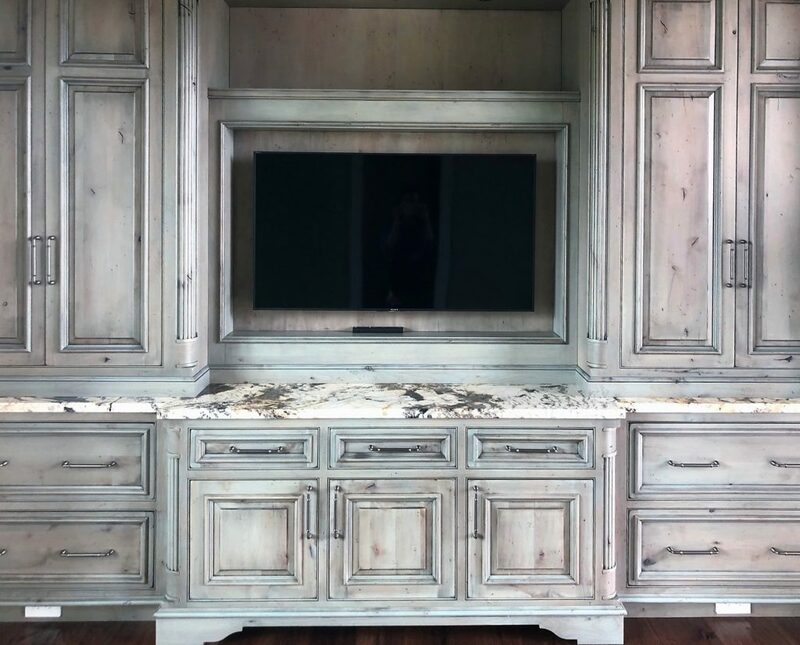 Custom cabinetry in stained Rustic Cherry and Knotty Alder in weathered & distressed black paint. 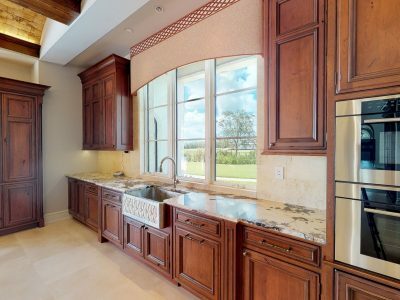 Grandkids & honored guests can freely come & go (without encroaching on the cookspace) and treat themselves to snacks & beverages from the twin armoires. 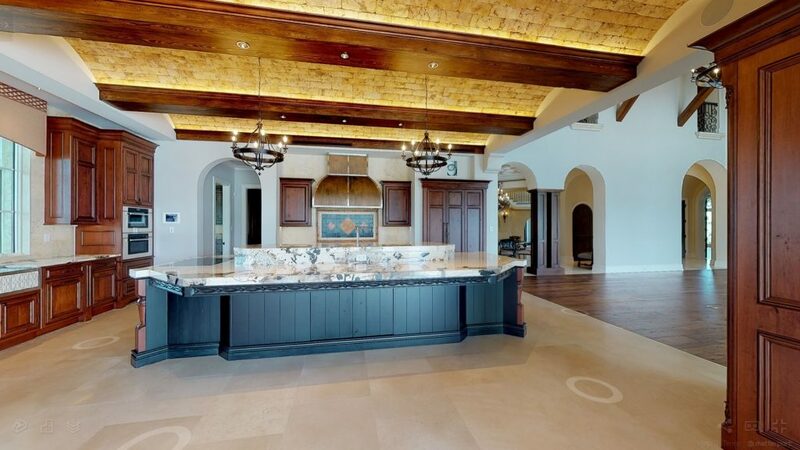 The tower to right is a fully equipped coffee bar cleverly concealed behind pocket doors. The Manorhouse Island is a 14′-0″ long x 7′-6″ wide jigsaw puzzle. 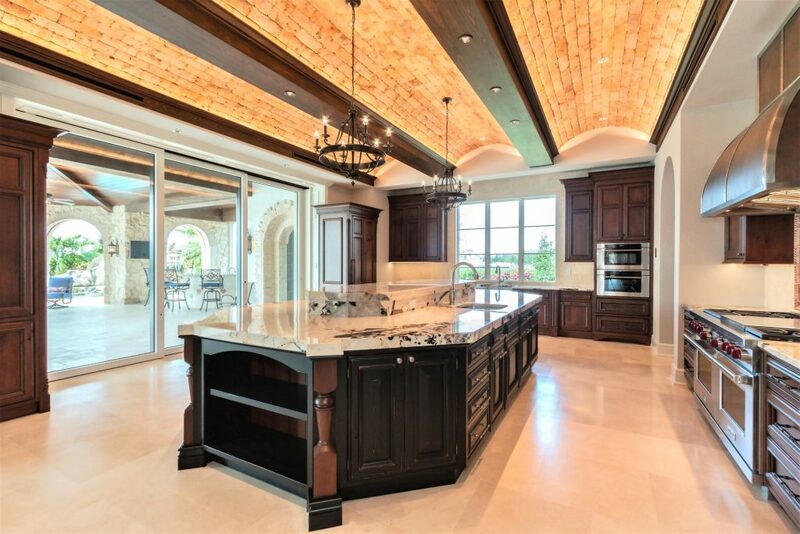 Seating for five plus a variety of essential kitchen functions is interlocked into one unified whole. 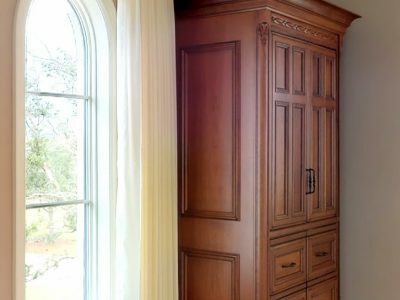 Notice the hidden access doors for deep storage built by Level Line Cabinetry in distressed black paint on Knotty Alder. 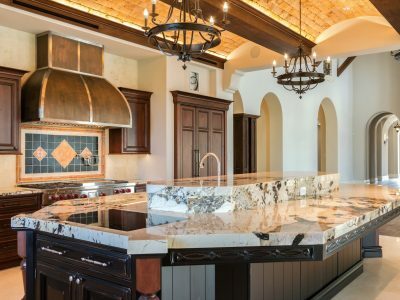 Luxe materials invite your touch: Rustic cherry cabinetry in silky, waxen finish; the knotty alder island in weathered, dusty black paint; a custom barrel-shaped range hood in bronze & steel; hammered nickel & carved stone sinks; and tactile surfaces of terracotta tile & stone. 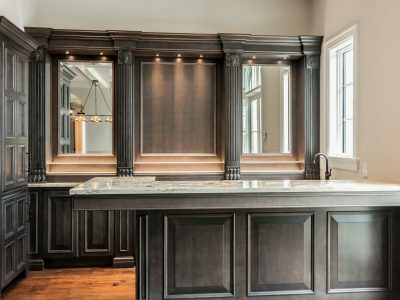 The luscious cabinetry & custom built-in furniture throughout the house were painstakingly designed by Jeff Sandifer and lovingly executed by Level Line Cabinets & Millworks. 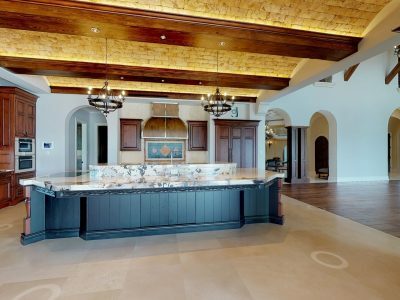 Deepest thanks to our entire team of master craftsmen. 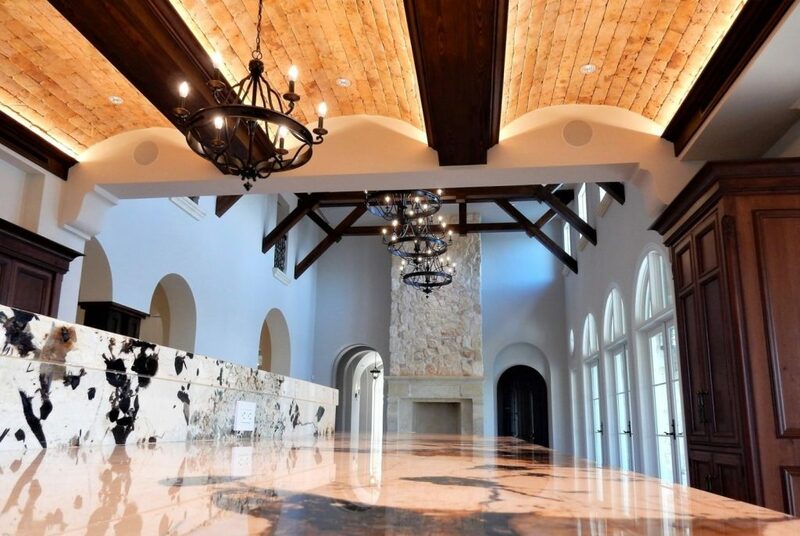 The dramatic wet bar nestles into a quiet corner of the Entertainment Lounge (complete with wine cellar, pool table & media center). Stately maple woodwork is stained a striking shade of slate (warm purple gray) and conceals professional grade refrigeration. 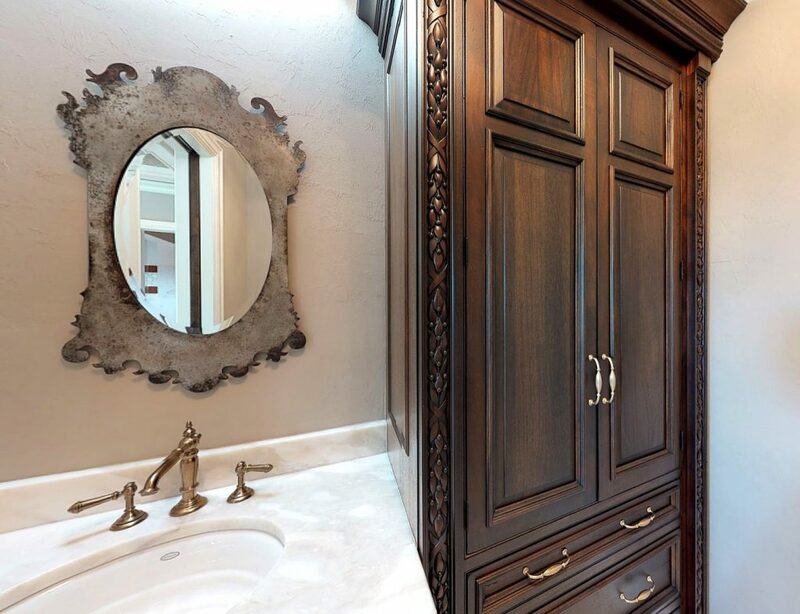 The lovely Makeup Table in sepia stained mahogany features a formal mirror surround, carved wood apron, and honey bronze hardware. 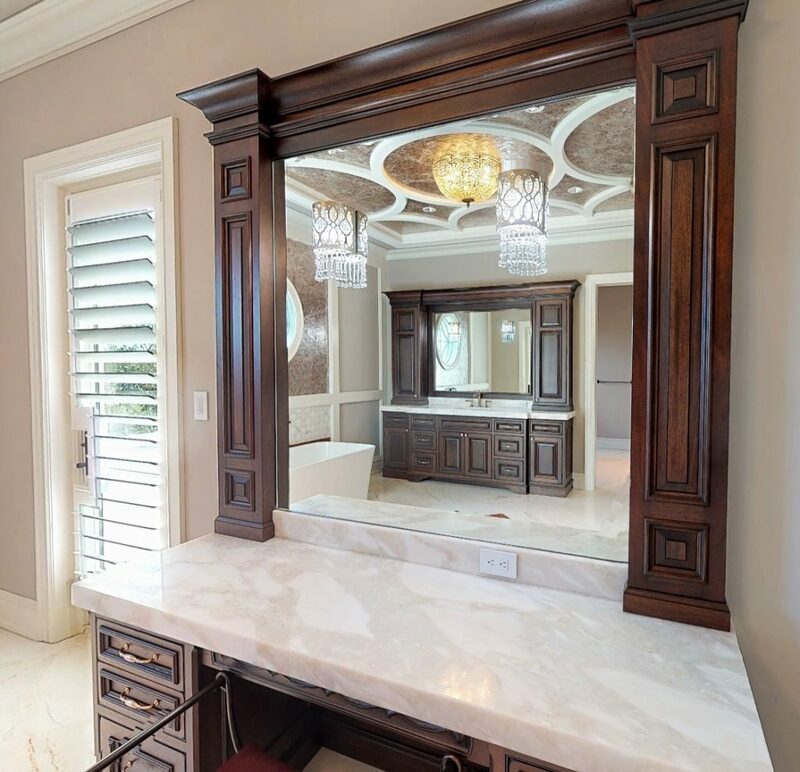 Her Powder Room is replete with a Linen Armoire, made-to-order and detailed with raised panel mahogany doors & woodcarvings in a laurel motif. V.I.P. Guest Suite: Greet the day in farmhouse comfort in this gracious morning kitchen. 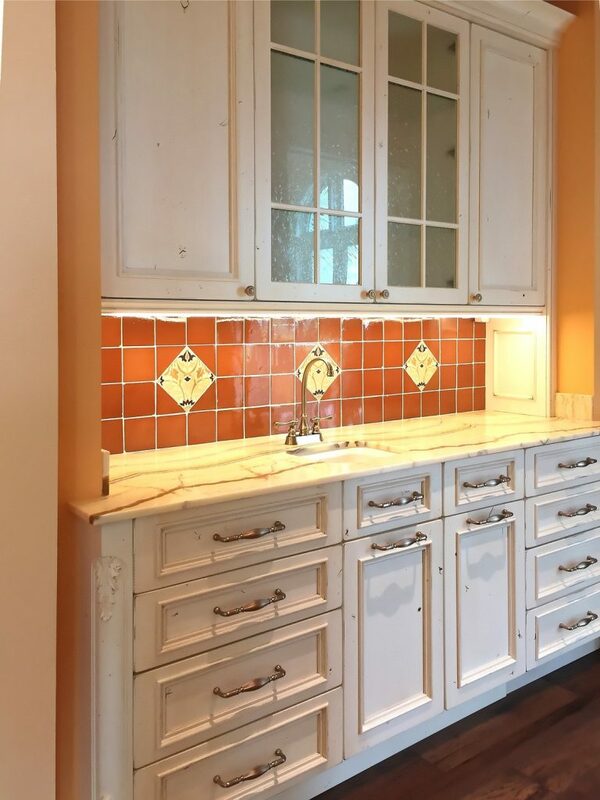 Bespoke cabinetry features a seedy glass, display hutch in white distressed paint. Hidden refrigerator drawers are stocked with breakfast sundries & milk. 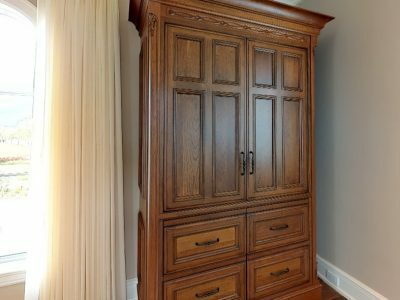 This handsome Armoire stands sentinel in one corner of the Guest House loft. 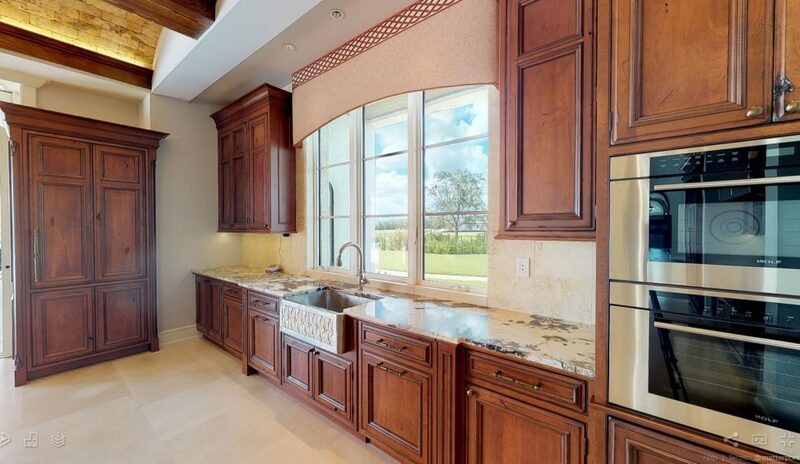 Behind wide pocket doors, a friendly coffee bar & sink are revealed with integrated refrigerator drawers tucked below. Designed & hand crafted by Level Line. Cherry wood in amber stain with silky smooth, waxed finish (modern analogue). Thoughtful design, careful engineering & faithful execution. 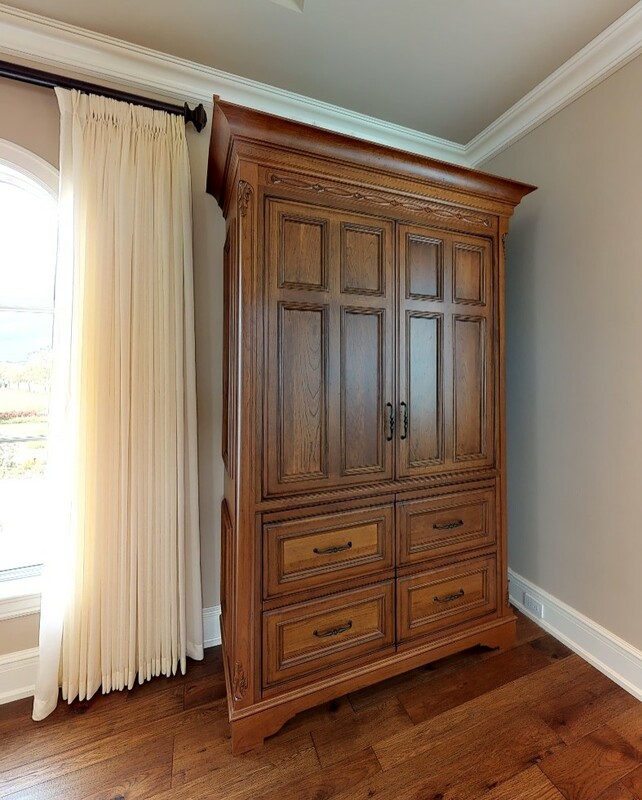 Fine furniture, built to client specifications by Level Line Cabinetry. His Study is a quiet sanctuary with timeworn woodwork in a weathered driftwood stain on knotty alder. The room is organized for business – with wide lateral files and tall pocket doors to conceal the office equipment. 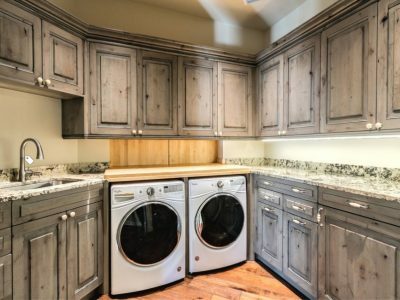 Who says a laundry room can’t be beautiful? 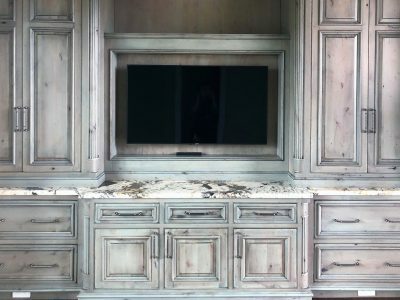 Driftwood gray stain on Knotty Alder cabinets. 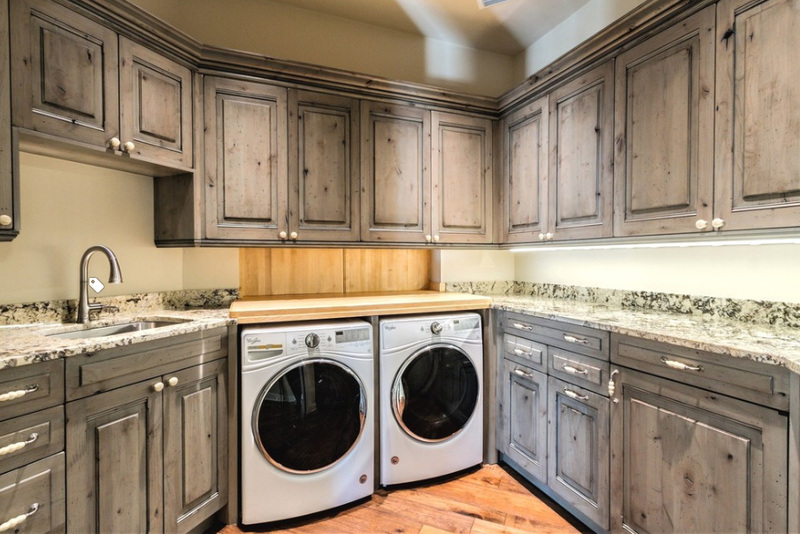 The high capacity washer & dryer is surrounded by box columns and 40″ high stone countertop. 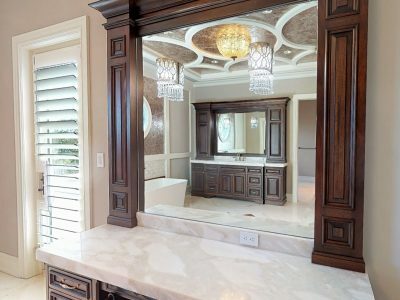 Now imagine your own special room: A perfect fit (just like your favorite pair of slippers). With every little creature comfort. And everything in its proper place. 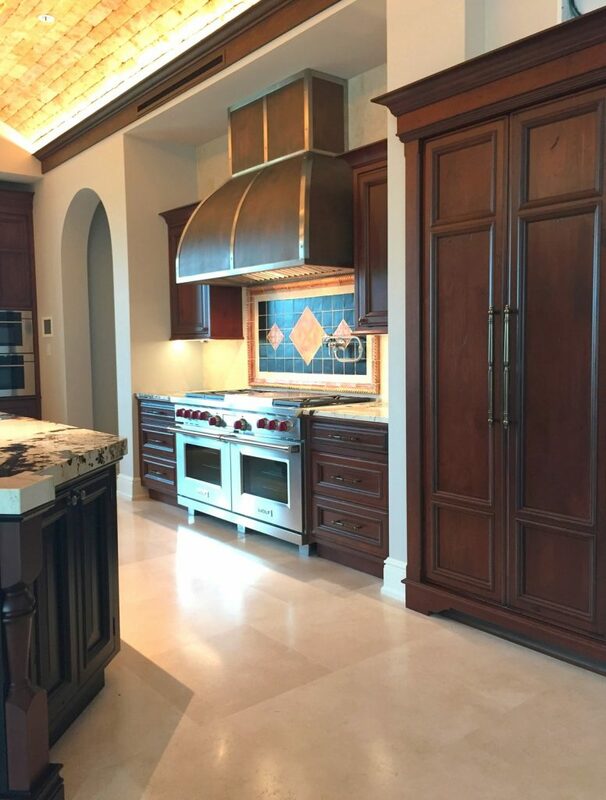 World class kitchens, baths, libraries & more. Well-loved spaces for celebration or contemplation. We listen first. 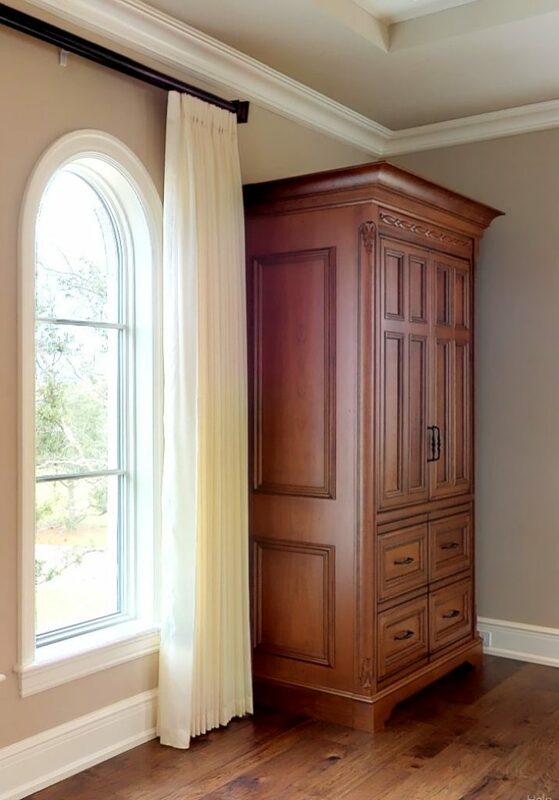 Then create unforgettable rooms with custom handcrafted furnishings. 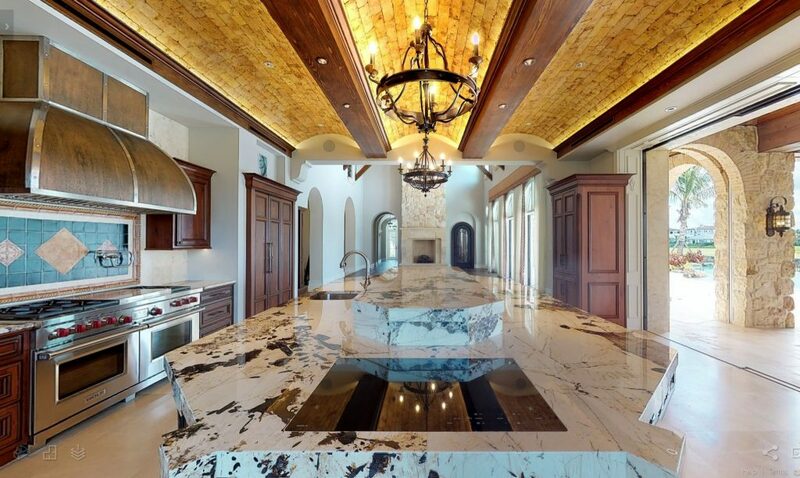 To make your place truly exceptional. Like no other….